Given the army of writers behind this big-budget B-movie, the story in this historical fantasy is pretty cheap. The Great Wall makes its debut Stateside after collecting some baggage full of notoriety in Asia. 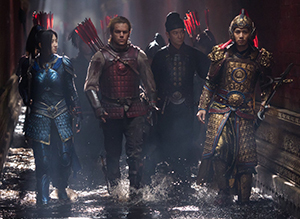 With a price tag around $150 million, it’s supposedly the largest production ever filmed entirely in China. It’s managed to recoup those base production costs in its Chinese release (China’s population is, after all, 1.4 billion strong), but the movie, directed by Yimou Zhang (The Flowers of War), received some flak for casting Matt Damon (the Jason Bourne series) as the lead hero. It’s a tempest in a tea pot. It’s not really whitewashing Chinese history. It’s not that Damon’s been cast to play an Asian character, a la Jonathan Pryce in Miss Saigon on stage. Damon plays a Westerner named William; he’s searching for this new substance called “black powder,” better known as gunpowder. He’s a thief, a liar and a killer. A triple threat with mad archery skills. The problem is, even though the Chinese built the engineering feat known as the Great Wall centuries ago, it falls upon this rather dippy-doodle Westerner to save the Chinese from tens of thousands of monsters. Simply put, this isn’t based on any sort of historical account. It’s Hollywood trying to cash in on the huge Chinese movie-going population. Set aside historical notions of defense against opposing armies, immigration control and taxes. This take on the Wall is based on “legend.” And that legend might as well have been written by six kids writing a research paper for third-grade social studies. Imagine those six kids are preoccupied with getting outside for recess and that puts the screenplay in some sort of rough context. A series of title cards set the stage against a CGI rendering of the Wall. According to the movie, the 5,550-mile long wall was built over a period of 1,700 years. It’s a summary that seems to be a dumbed-down, over-simplified cherry-picking of a Wikipedia entry. It’s not that The Great Wall is a particularly bad movie, but it’s not really all that good, either. It’s simply lacking in a few key areas. In particular, more effort should’ve been put into infusing a little more real Chinese history into the fantasy. The story could’ve also benefited from more investment in character development and retooling some ill-defined character motivations that, after a round of betrayals, lead to an unlikely (and gratingly cutesy) conclusion. It’s not too much to ask for. Think about the pedigree of the gaggle of writers behind this tale. Tony Gilroy (Rogue One: A Star Wars Story and a whole bunch of Damon’s Jason Bourne movies); Max Brooks (son of Mel Brooks and author of the novel behind World War Z); Edward Zwick and Marshall Herskovitz (teamed on The Last Samurai); and Carlo Bernard and Doug Miro (teamed on Prince of Persia: The Sands of Time). Collectively, they should’ve been able to put the building blocks in place that would’ve made The Great Wall a great movie. The potential was there for something really cool and at least sorta fresh, but one of the coolest things is practically a throw away. As it happens, while the Chinese wage war on this savage horde of dinosaur-like monsters (that look like something out of a Stan Winston workshop), they’re honing the craft of air travel by way of hot air balloons. But the technology isn’t quite ready for prime time. That’s cool. That makes for some great visuals. But the concept isn’t taken far enough. And the movie is full of great, colorful visuals. There are loads of eye-popping costumes and props and set pieces. The bulk of that $150 million budget makes its way to the screen in some fashion. The Chinese are also trying to keep the lid on the dangers of the black powder; it’s a secret they don’t want to eek out into the world. That leads to a subplot that gets mired in some silly backstabbing and character machinations by way of Willem Dafoe (John Carter) as a shady dealer and Pedro Pascal (Narcos on Netflix) as Tovar, William’s partner in crime. These Westerners are merely a cheap, detached way of instilling something resembling human drama and human conflict, given the monsters don’t speak a lick of Chinese or English. In addition to all those colorful (and CGI-heavy) visuals and an aggressive score by Ramin Djawadi (Pacific Rim), there are lots of great, fresh faces, led by Tian Jing (the forthcoming Kong: Skull Island) as strong-willed Commander Lin in the Chinese army. She’s also easy on the eyes, even while loaded up with stylish armor. But maybe the most curious thing about this fluffy, sticky B-movie cotton candy is Matt Damon’s beard. As the movie opens, William and Tovar are mighty hirsute and they’re packing the stink to match. When Damon speaks, there’s an undefinable accent going on. It’s like the facial hair isn’t enough to hide behind, he needs a little something else to help further separate him from his own questionable casting decision. Well, after passing through the Great Wall, it’s time to clean up. With the beard gone, so goes the accent and Damon sounds a whole lot more like Damon for the rest of the movie.